When it comes to treating leg veins problems, there are measures which can be taken in the home as well as by a physician. First off, elevating the legs as often as possible will relieve the stress on leg veins. The elevation should be above the heart for a half hour of each restful period. Ted hose, or compression stockings should be applied at the start of a day. If pain is experienced, a doctor should be notified. Following a diet of low salt and fat and high fiber is suggested to lose extra weight which adds to vein stress. Take a walk every day. Also, avoid tight clothing and drinking alcohol. 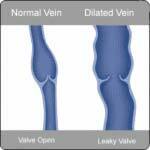 Among the medical treatments of problem veins, is a phlebectomy of varicose veins where a section of a vein which is severely affected is removed. Besides surgical treatments for varicose veins, varicose vein laser surgery is also performed. Aside from what can be done at home and medical care given by a physician, physical therapy is also prescribed at times in order to improve circulation.